Today’s podcast replay of The Local Zone w/Brooks Carter (and guest co-host Jamal Williams). They touched on some high school baseball, the Mocs, and Vols football. 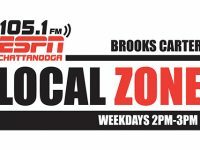 On today’s Local Zone, Brooks is joined by guest co-host Jamal Williams in-studio, as they break down several local and regional sports topics and headlines. On today’s Local Zone, Brooks is joined Chattanooga Red Wolves’ Coach Tim Hankinson, and breaks down just how good the SEC MBB coaching roster is. LISTEN: The April 2nd podcast replay of The Local Zone w/Brooks Carter. Today’s Local Zone podcast replay (Monday, April 1st), including an interview with Mocs’ Football HC Rusty Wright.